It is infinitely uplifting to pick the produce of Mother Nature from one’s own garden. 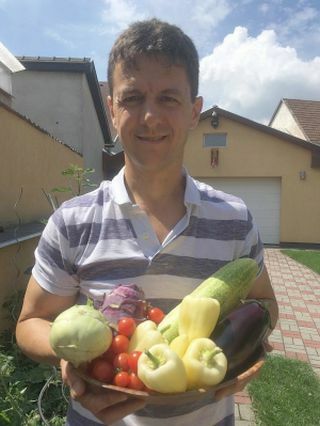 I take care of the various plants in my small garden as my schedule allows for a few hours every week in a sort of laissez-faire style without any formal gardening experience or agricultural training.It is infinitely uplifting to pick the produce of Mother Nature from one’s own garden. I take care of the various plants in my small garden as my schedule allows for a few hours every week in a sort of laissez-faire style without any formal gardening experience or agricultural training. And what a joyful activity it is! In the 2016 season it is especially true when my garden pays me back with record amounts of produce. Every plant, whether I grew it from seed, put it in the ground as a seedling, or those which I watched springing up in random places as messengers from years prior, all surprised me with yield that was incredible in volume as well as quality. Even the lawn which I laid myself years and years before and which started to thin out three seasons ago was producing thick, quick-growing grass with renewed stamina week after week. My fig trees which I planted in the Fall of 2015 had grown considerably by about 20 inches, further exhilirating their farmer’s upbeat mood. The story of the 2016 season started with a fantastic yield of the young strawberry patch where, early on, instead of the usual average of 4-5 flowers on the plants, I counted up to 23. Twenty-three! That’s got to be some sort of record. Next were beautiful butter and iceberg lettuce, then kohlrabi followed by raspberries, peppers, cucumbers, tomatoes and eggplant. The butternut squash is still getting bigger and slowly turning from green to yellow. Our family happily consumes these healthy and flavorful fruits and vegetables freshly collected from the garden. Sometimes we even eat them right on the spot without washing after picking them off the plants as we know they were not exposed to any chemicals, pesticides, fertilizers, enhancers other produce one can buy in stores or markets would have been sprayed or treated with. This is the third season since I have started using the preventative methods recommended by András Kovács-Magyar, which means I spray the plants exlusively with Matrix Drops products on a weekly basis. Also, I use manure regularly, but source it only from a controlled farm, to replenish nutrients in the soil. I know I can thank the miraculous caring and nurturing of the Matrix Drops products for these fantastic results. As a weekly routine, I’m constantly checking for the presence of any pests, parasites or infestations on the leaves or around the plants and, when necessary, I use the appropriate Matrix Drops products developed for the given problem. As a preventative measure, to strenghten the aura of the plants, I usually use a mix that I prepare in advance, but I also spray them with the most important and relevant products based on the monthly gardening newsletter written and released by András. The list of Matrix Drops products contained in the mix I use weekly can be found at the end of this article alongside the list of drops I use monthly and others I apply in special circumstances or during specific times of the year. However, here I would like to highlight my favorite product, the Matrix Drops #2015, which has been developed by András Kovács-Magyar and Ildikó Kovács-Magyar to support plants with the information patternof flower initiation. I believe that the gratitude of my plants, which they express through record yield, is in large part due to effects of this particular Matrix Drops product. In an extreme case, in addition to the already mentioned strawberry example, this gratitude can be highlighted by the cocktail tomatoes in the garden which brought so much fruit that the green leaves can hardly be seen from all the red. This is a rare gift to my kind of a gardening enthusiast. To that end, I would like to recommend the tried, wondrous Matrix Drops method to all hobby gardeners or to those that have bigger farms. It’s worth a try as the results will speak for themselves! I wish everyone the happiness I have lived through which originates from the extraordinary volume and quality of produce harvested as well as from the peace of mind and liberating knowledge that there is a path to follow for growing food for our families totally free of pesticides, fertilizers and other, potentially harmful materials. MD# 2028– bacteria, fungus, virus information pattern products. MD# 2018 – Grass information pattern products. In late Fall and early Spring, use MD#2013, the Winter/Spring rinser.